New shoes, new drawing: pencil work on A3 paper. 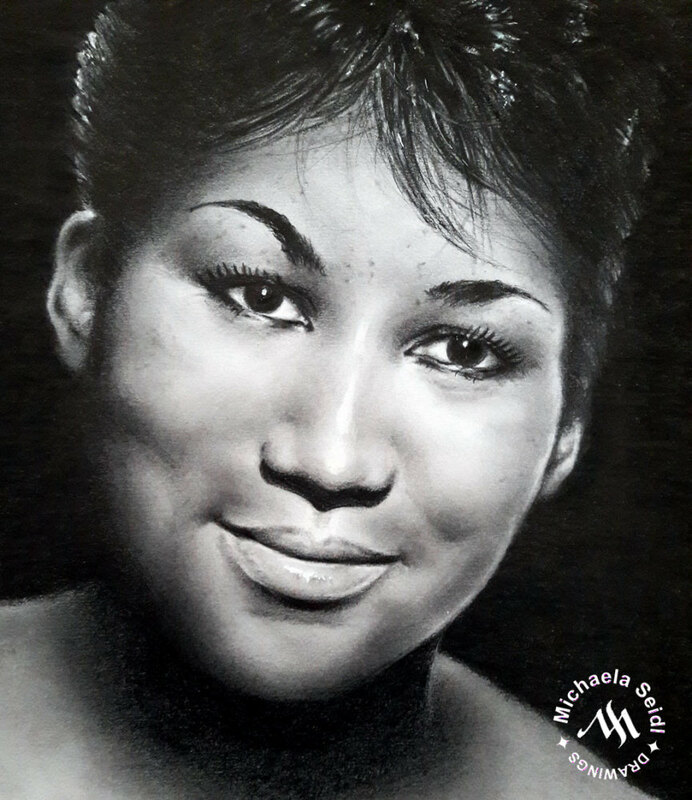 Portrait of late soul singer Aretha Franklin, pencil on A3 paper. 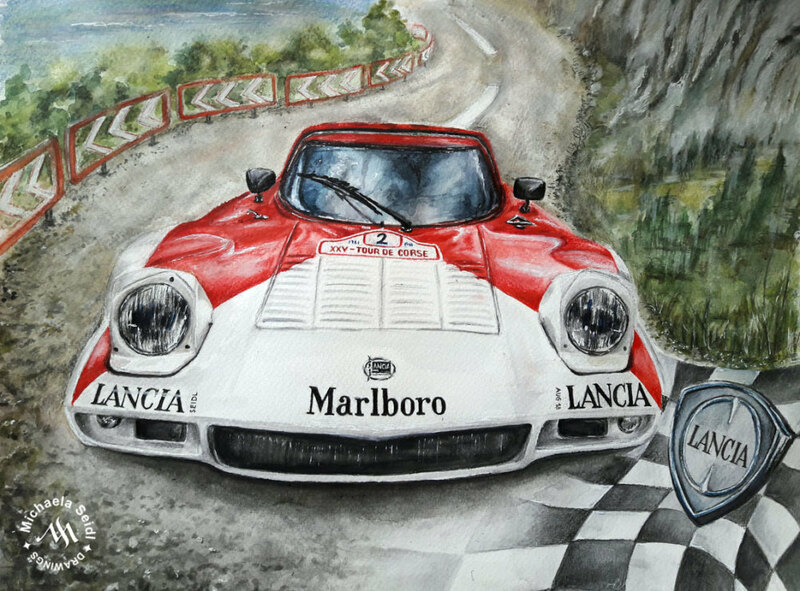 A participant of the Tour de Corse: Watercolor painting on A3 paper. 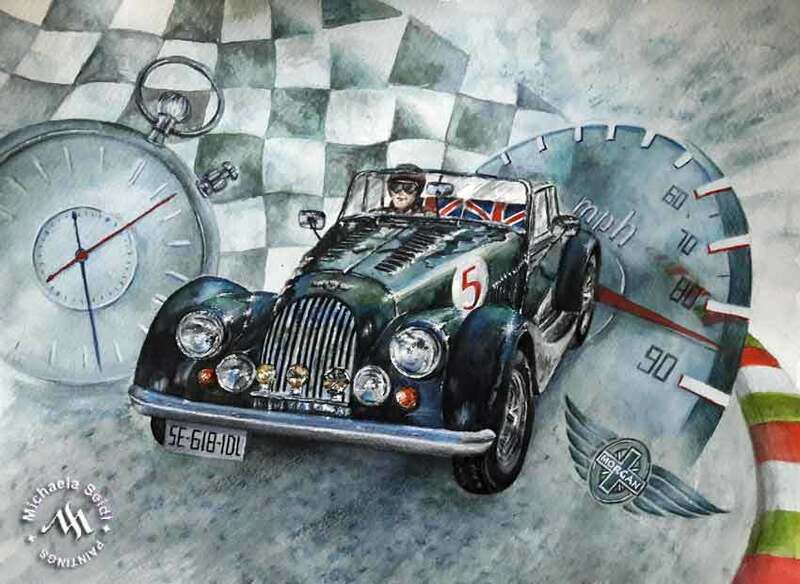 This car with a character was fun to do, along with creating a coherent surrounding for the Morgan. Watercolor painting on A3 paper. 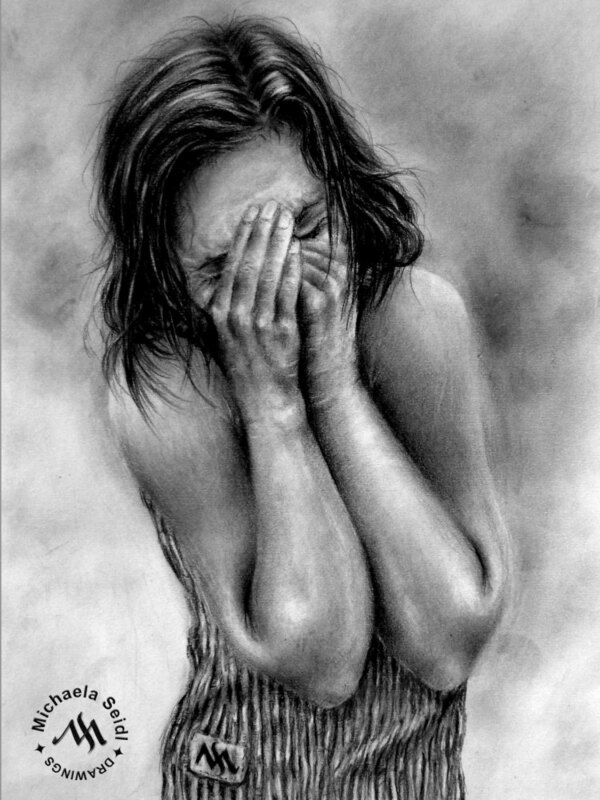 Black pencil and white gel pen on A3 paper. Nightly street scenery reflecting bright lcity ights. Another watercolor on A3 paper. Scenery reflected in a puddle. Watercolor on A3 paper. 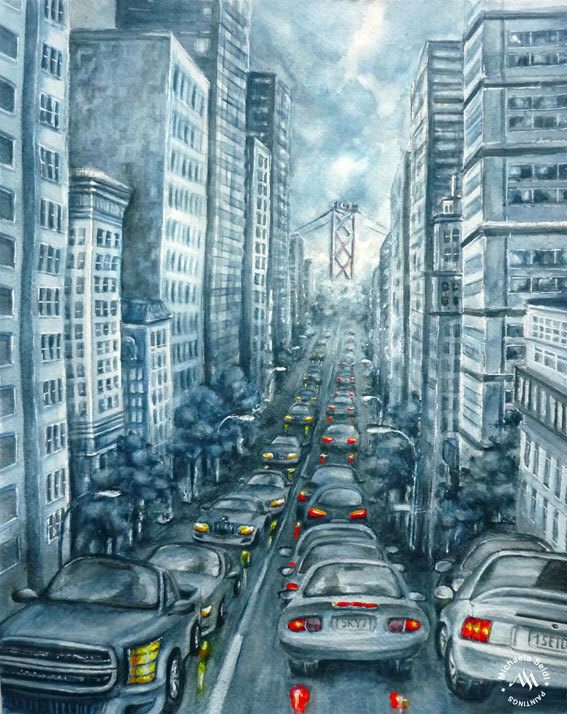 And one more watercolor: a free interpretation of a street in San Francisco on A3 paper. 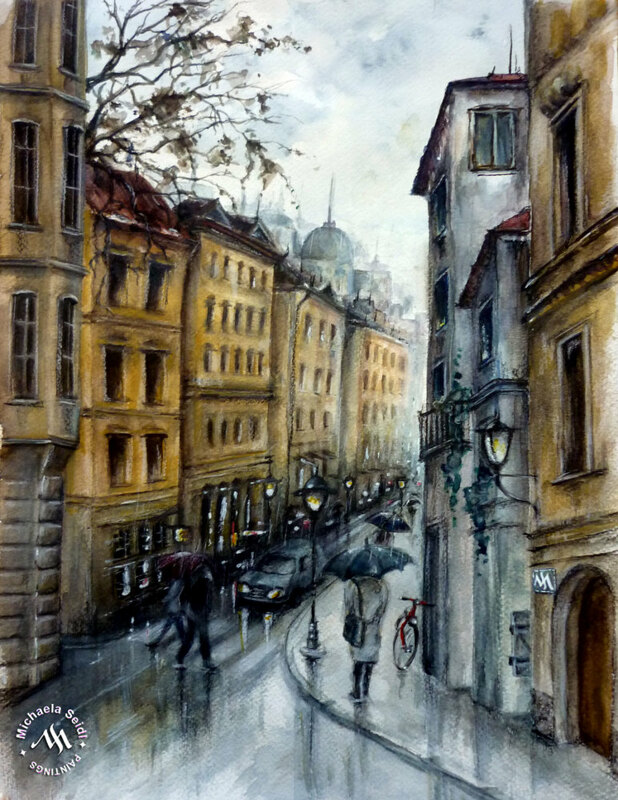 Another watercolor: Street in the Rain is a fictional scenery on A3 paper. 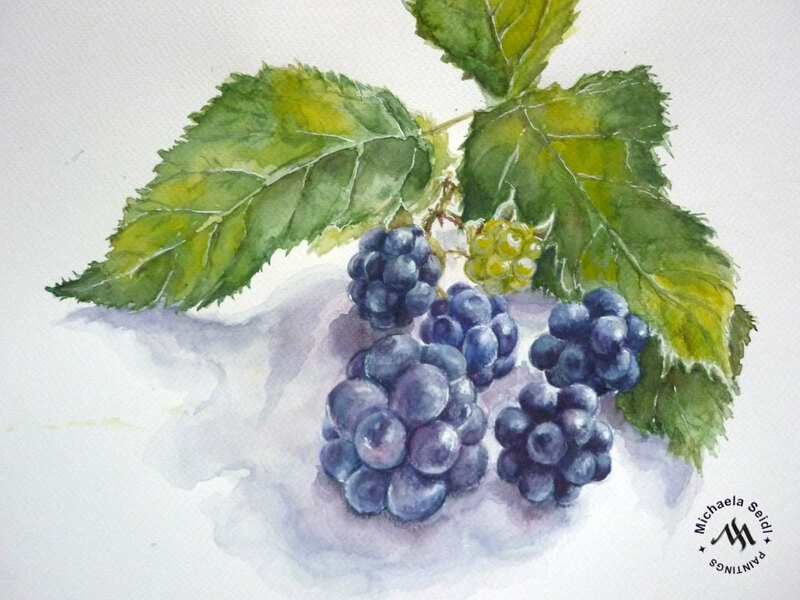 Remembering summer: watercolor painting of blackberries with leaves on A3 paper. 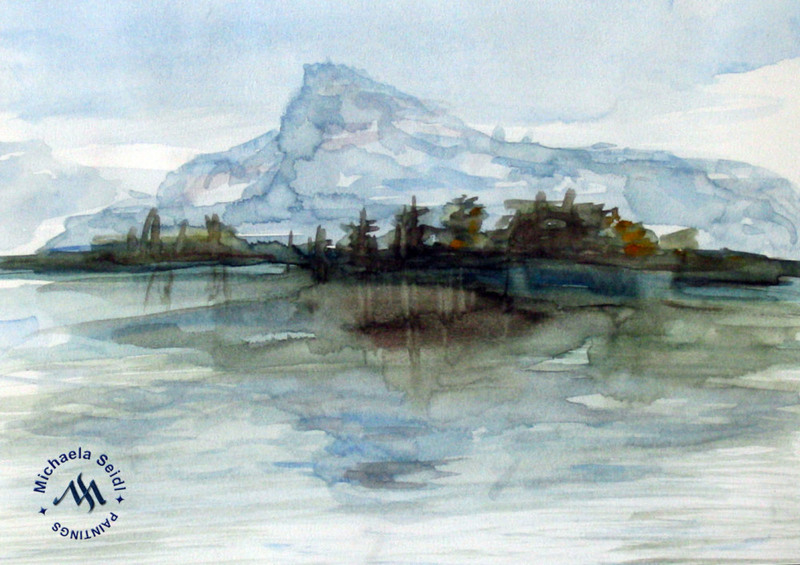 An older watercolor I haven't shown before: Mounting reflecting in the lake on A4 paper. 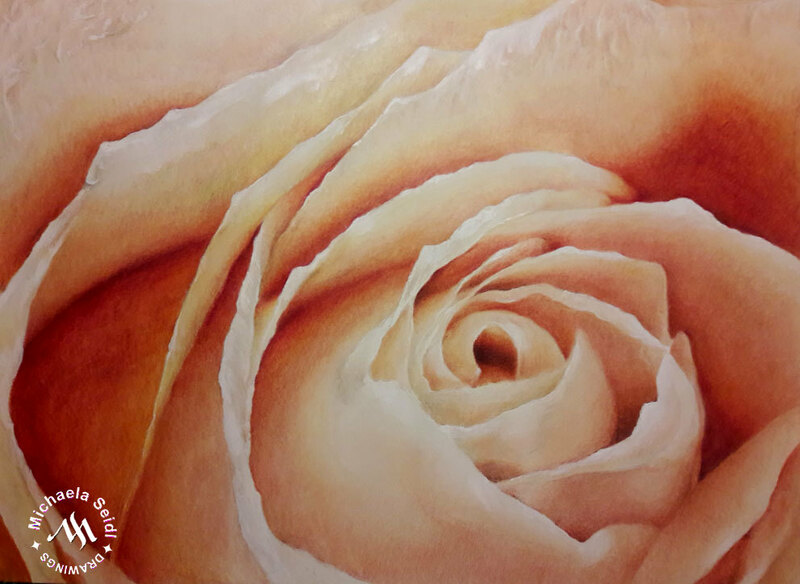 The peach colored rose is a mixed media work done with colored pencils, a white highlighter pen and acrylic and watercolors on A3 paper. Latest drawing of mine with a summery atmosphere on A3 paper. I have used grey and black pencils and a white gel pen for the highlights. 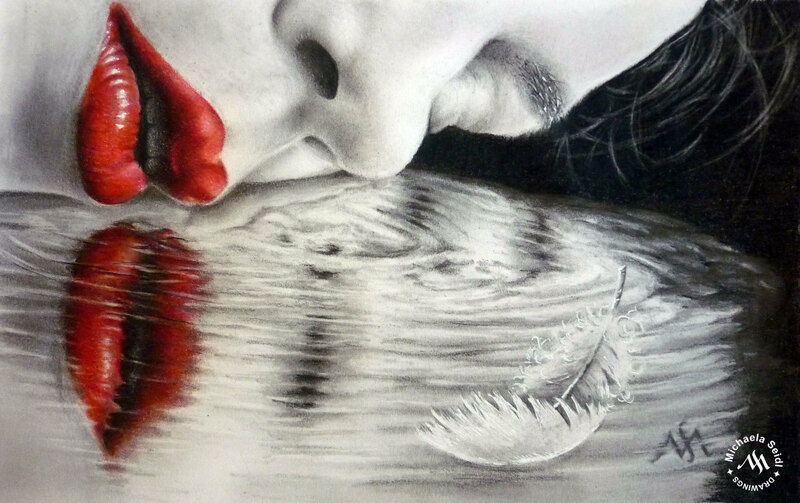 Another pencil drawing with a black polychromos pencil on A3 size paper. 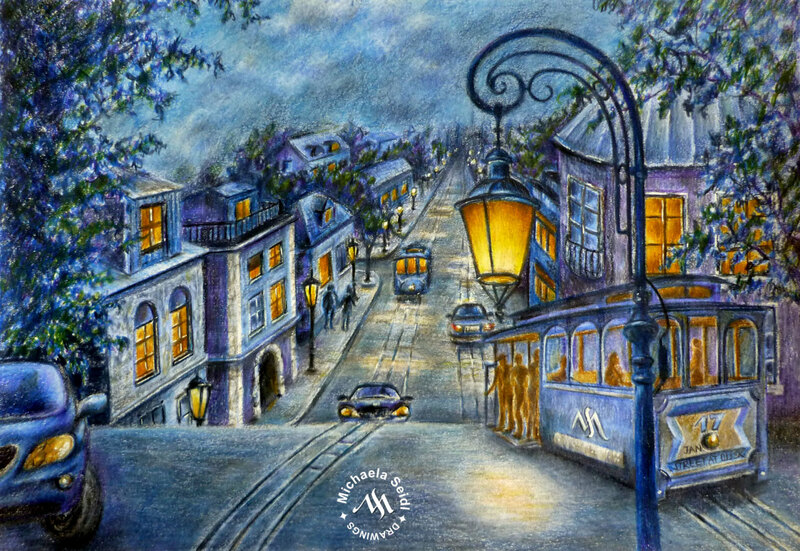 Another polychromos drawing, this time a little street scenery at dusk. I concentrated on my favorite color blue. The yellow light brings some atmosphere and warmth into the area and contrasts nicely with the blue shades. This cute little cat has been a Christmas commission. 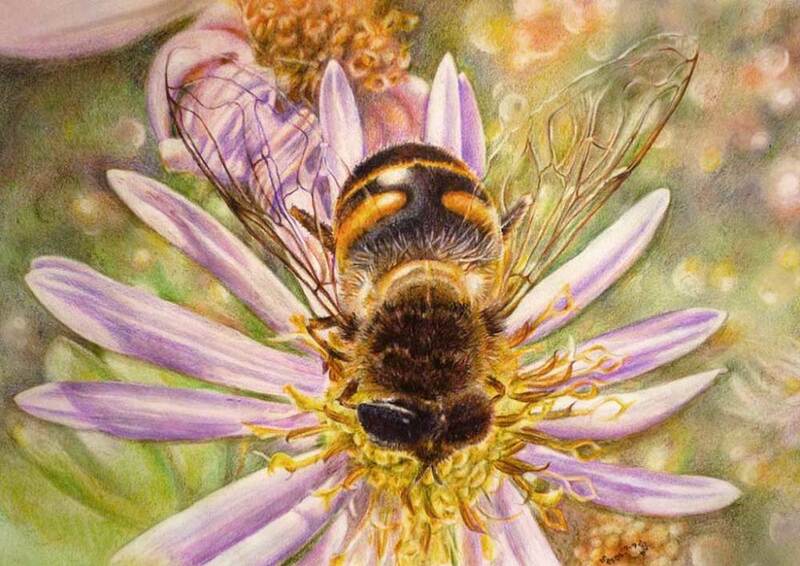 The drawing with polychromos pencils is on A3-format size paper. 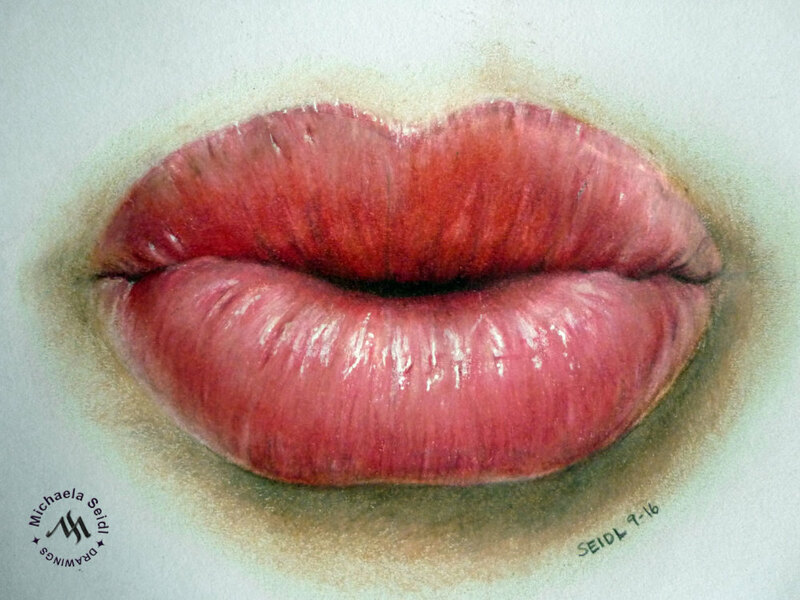 Drawing of luscious red lips with polychromos and a white gel pen for the highlights on A4 size paper. 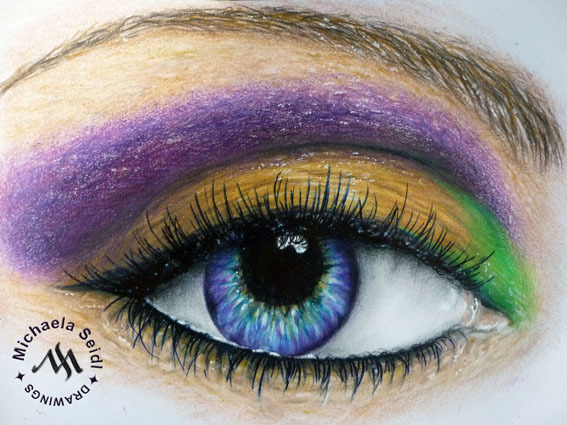 Another eye, this time colorful and bright on A4-size paper. 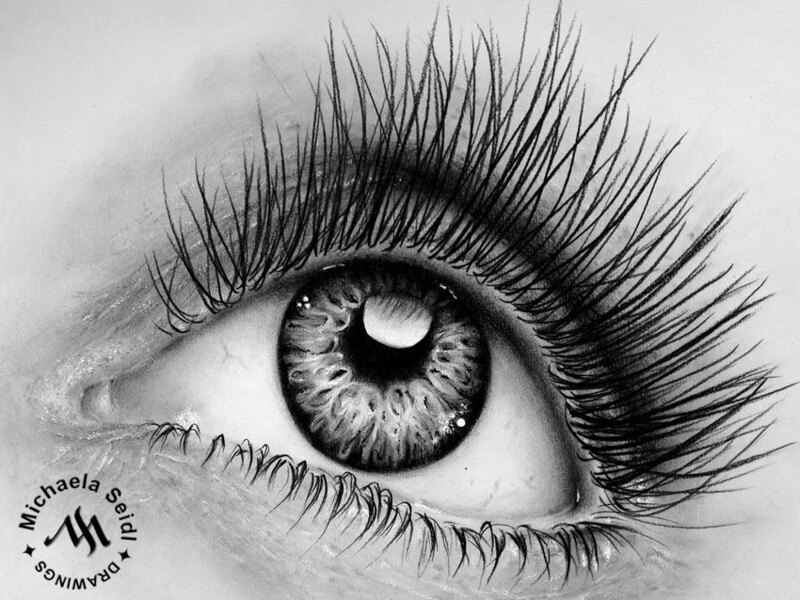 Gel pens in black and white have been used for the lashes and the pupil and for the highlights. 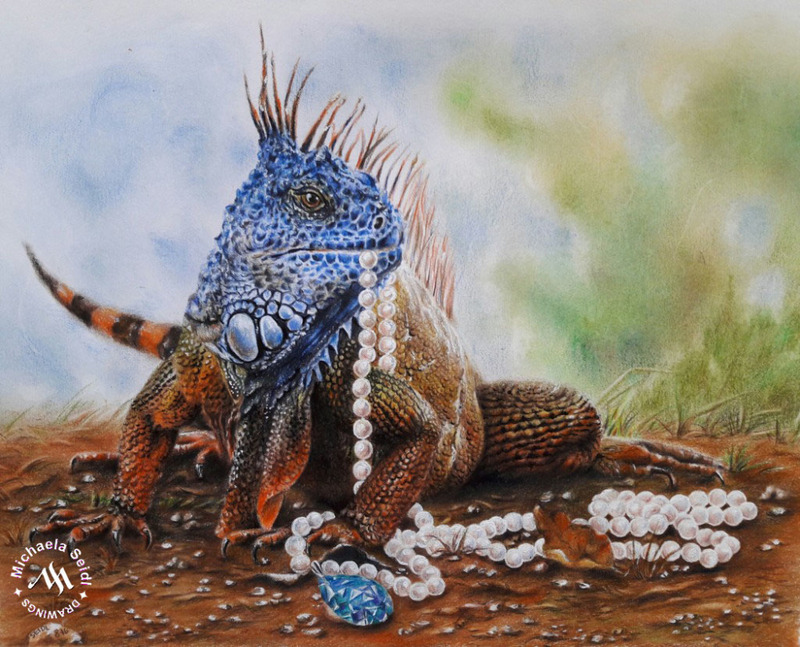 A very time-consuming drawing finally finished: this muliticolored iguana is based on a photo by photographer Wolfgang Stocker, who let me use his shot as an inspiration. For the fun of it I decided to add some fancy bling. A3 size drawing with colored pencils and a white gel pen to make the highlights sparkle. 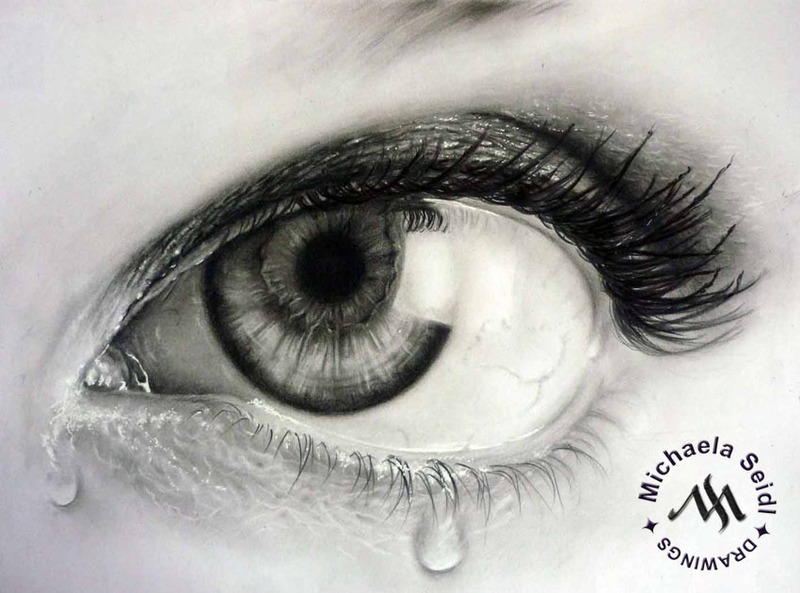 My latest pencil drawing on A3 size fine grain drawing paper. Different textures such as skin, water, drops, and diamonds beaming radiantly in the summer sun. Drawing of the Swedish actress, black polychromos on paper, size about A4. 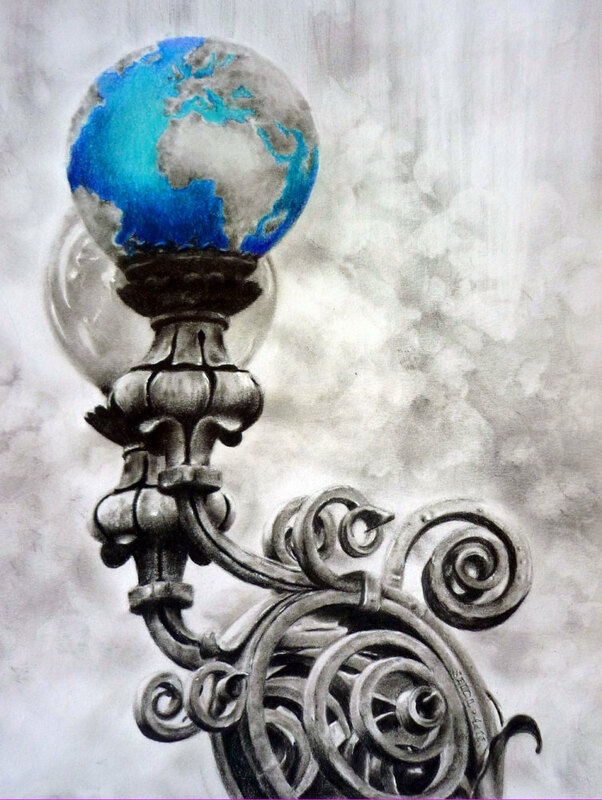 Iron wrought Lantern with a light of a different kind. Inspired by one of Wolfgang Stocker’s wonderful shots. 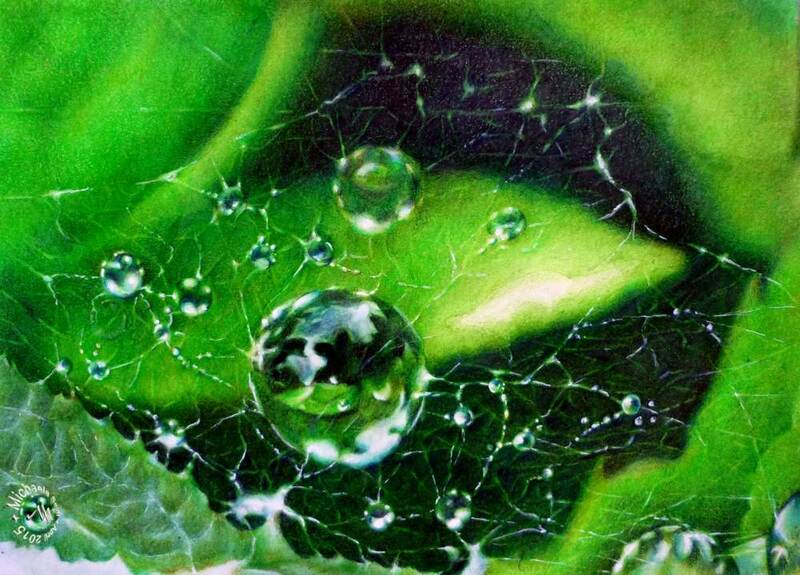 Polychromos on Paper, size A3. Another eye, this time bigger than ever. I tried A3 format with a black polychromos pencil and a white gel pen for the highlights. 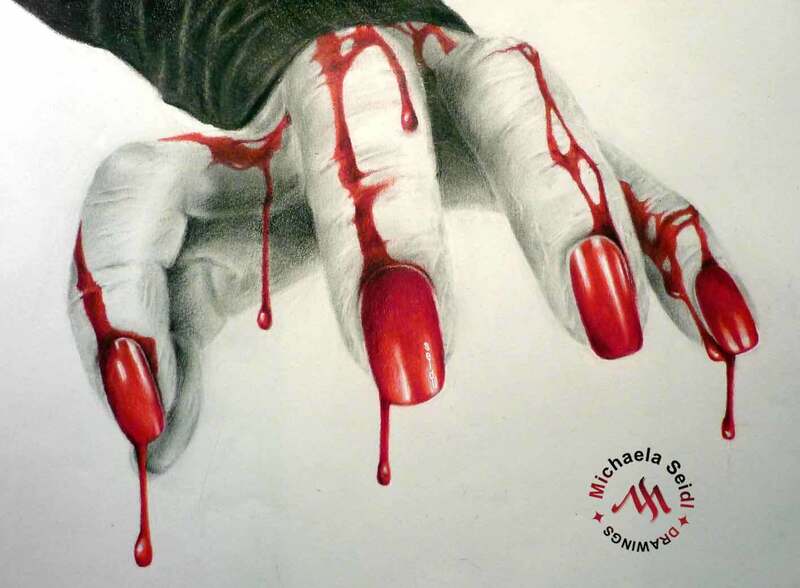 A bit of color dripping off the hand, some creepy stuff done with colored pencils on A3 paper. 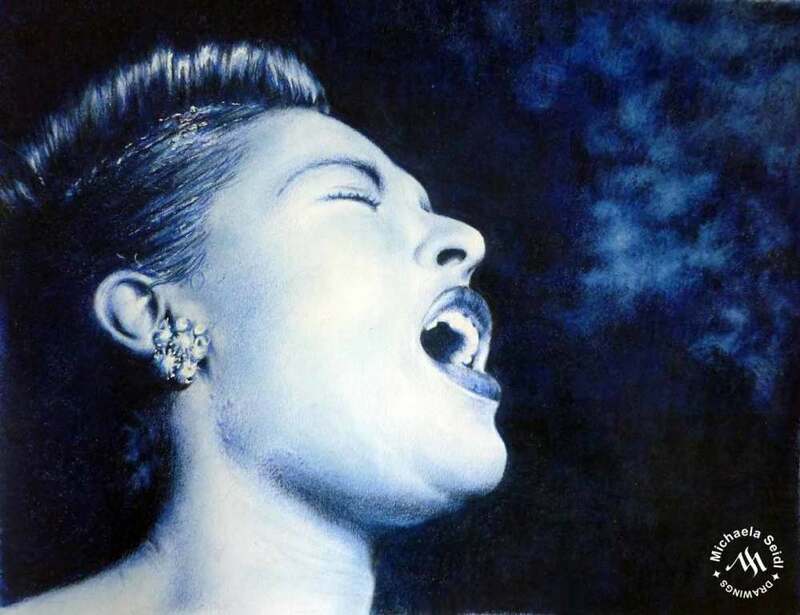 A tribute to the legendary performer “Lady Day” who would have turned 100 years in 2015. 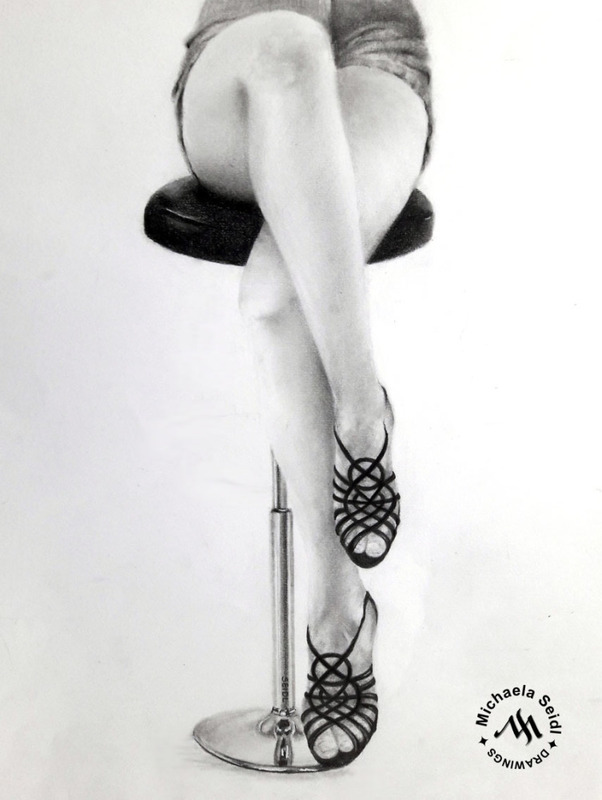 Based on a photo by William P. Gottlieb, 1947. Lombardic letters have this characteristic shape that allow ornate designs and patterns. I decided to design my own alphabet and play with shapes. I have used a black fine marker pen to draw the outlines. For the colorful gradients I have chosen colored pencils adding some highlights with a white marker pen. 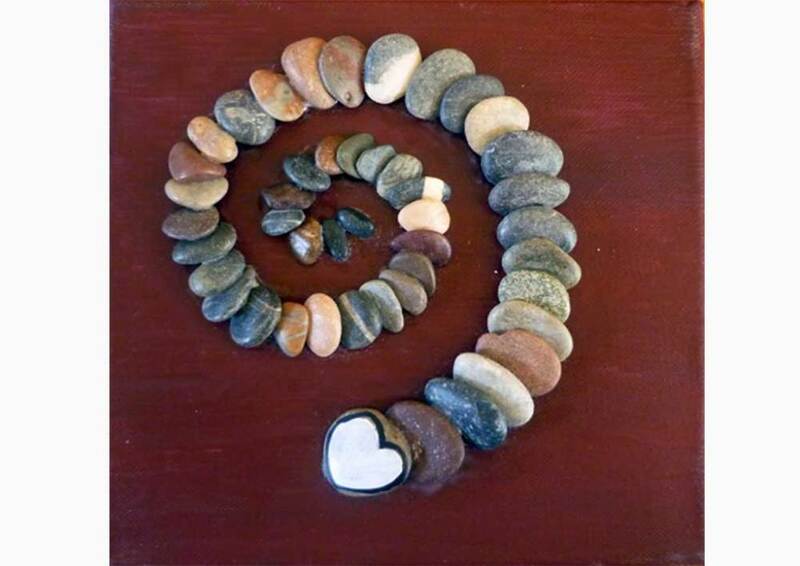 To give it a special touch I have written each letter on a pebble. With a frame around it this little calligraphy project is not only fun to do but also an eyecatcher. 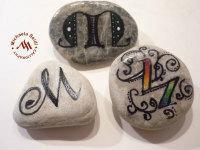 This is real fun to do: Collecting some pebbles on the lakeside and embellishing them with colorful and fanciful letters or meaningful sayings. 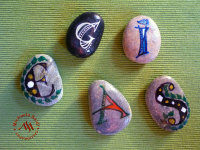 More calligraphy pebbles fun with gel pens and colored pencils on pebbles on the first photo. The seond shot shows embellished capitals written with gel pens and colored pencils on paper. 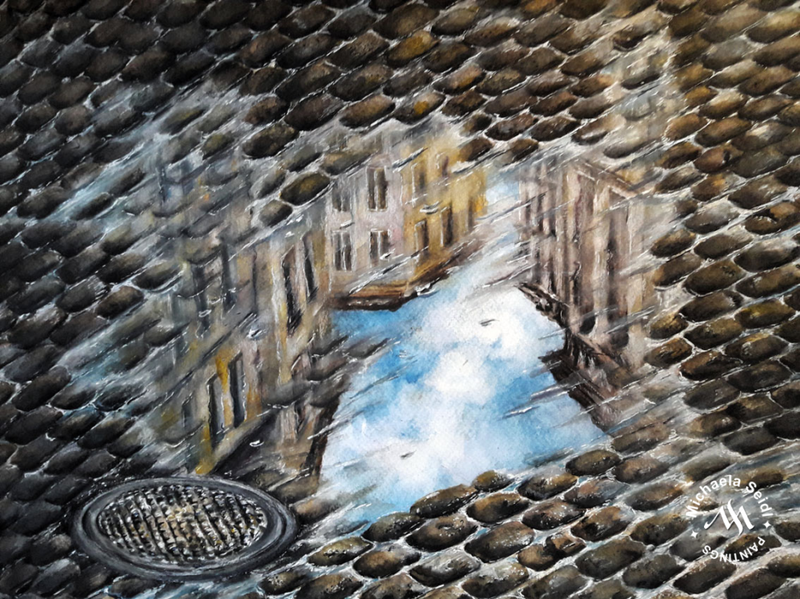 Acrylic colors on canvas, a two piece acrylic painting. 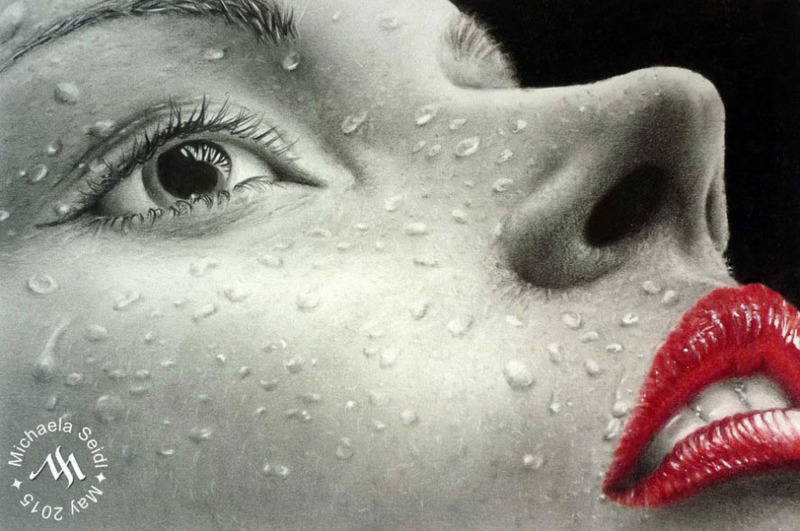 For this drawing of a face with water droplets I have used primarily a pencil and a touch of red for the lips. This mixed media challenge required a watercolor foundation, several coats of colored pencils and a touch of ink, next to lots of time and an equal amount of patience. 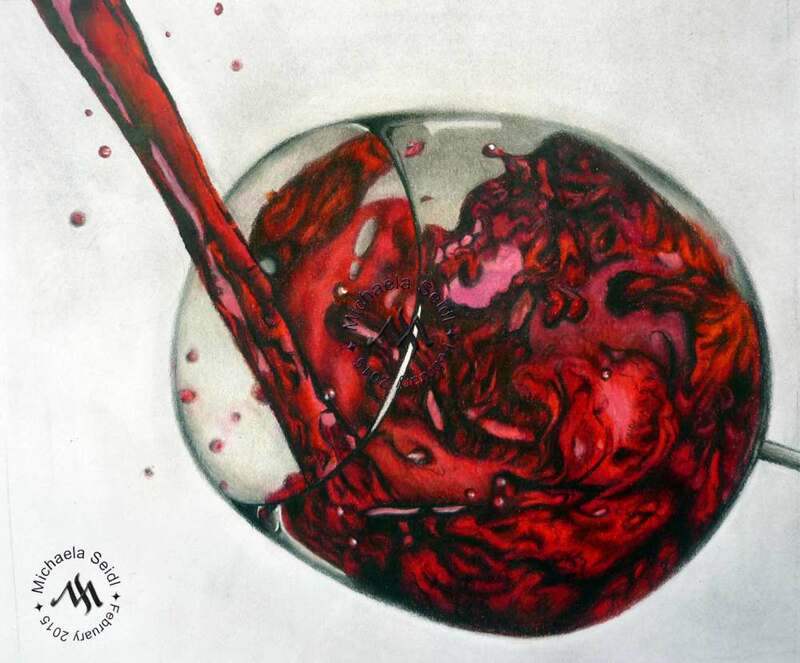 Red wine being poured into a glass. Colored pencils on A3-paper. 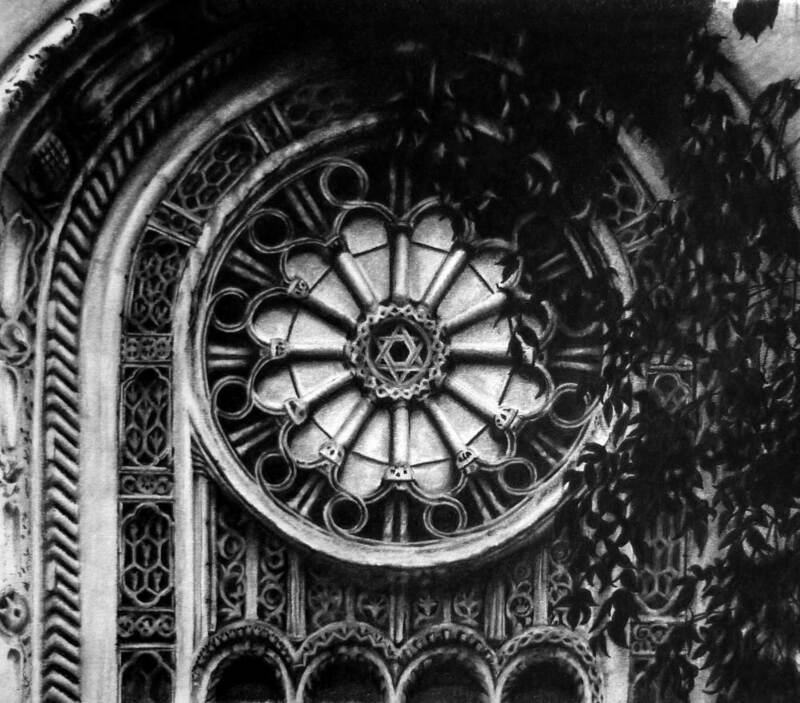 Pencil drawing of the richly decorated facade of the temple Emanu-El with the beautiful stained-glass rose window in the center. 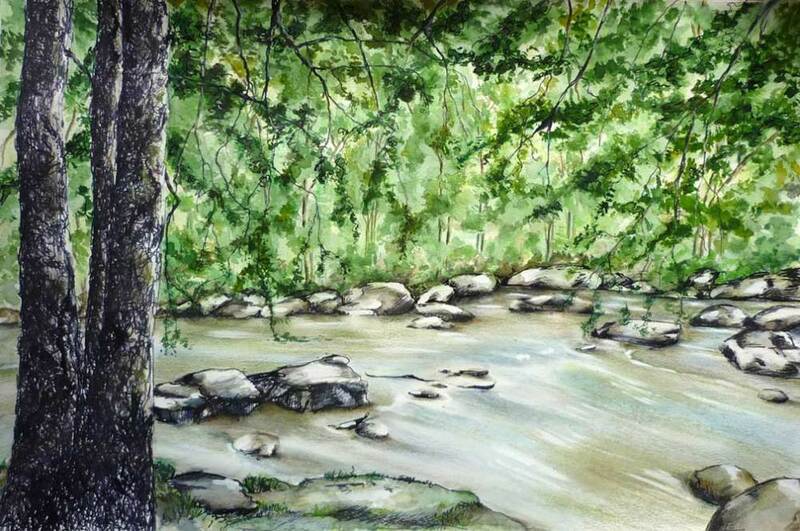 A mixed media project done with ink and pen, watercolors and colored pencils showing a picturesque riverside in Upper Austria. 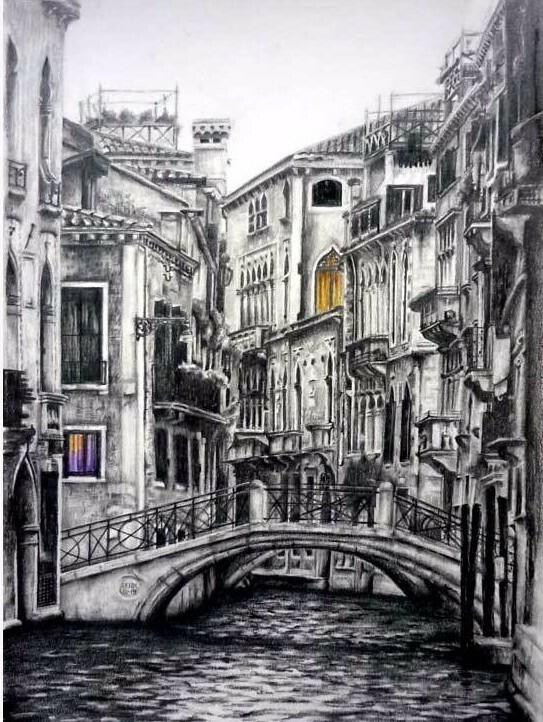 A very challenging pencil drawing of an atmospheric Venice canal with a touch of color. Another one of Wolfgang Stocker's masterpieces. Follow his Italian tracks if you like. 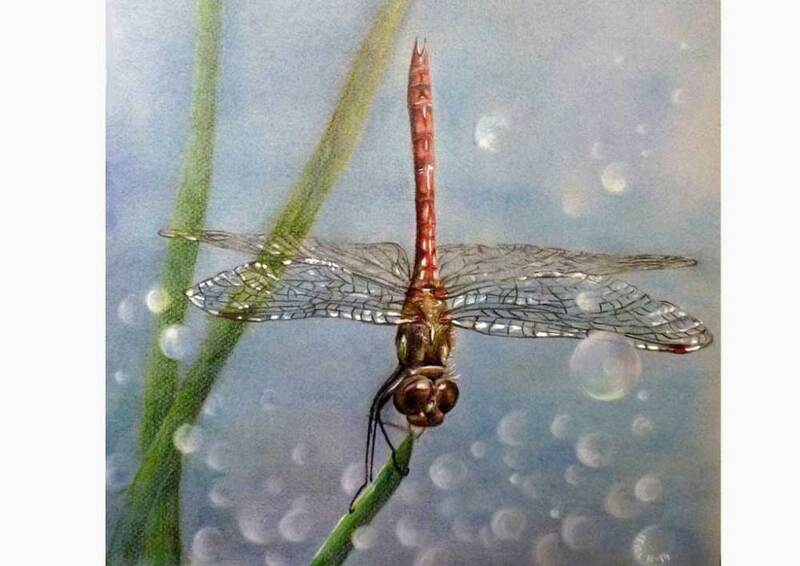 A flashback on summer – dragonfly drawing. 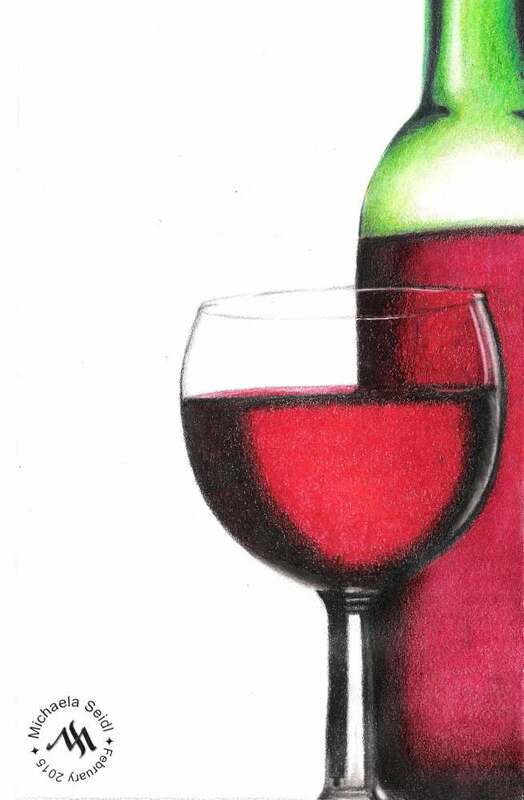 Colored pencils plus pastels on colored paper. I almost forgot about a silk tie I did ages ago. Until I came across it recently. 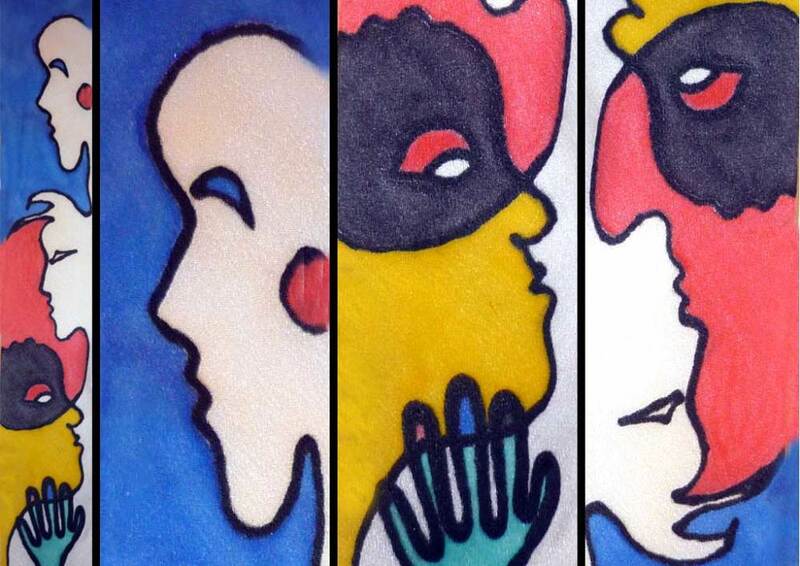 The four faces on it were done with one line only. That’s about the only thing that makes it somehow worth mentioning. And: I really wore it… last century. 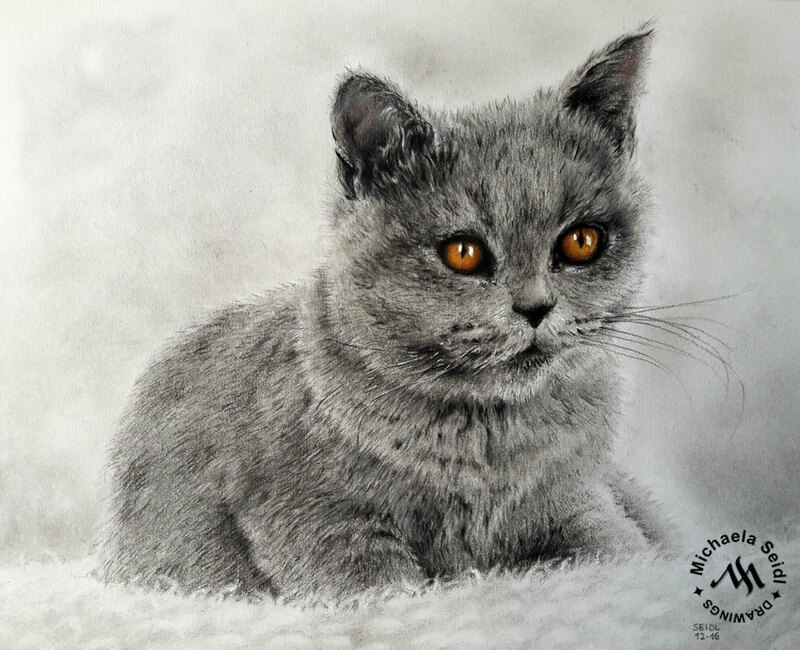 A very time consuming drawing finally finished: Colored pencil drawing with a touch of watercolor on A3 paper, based on a photo by Wolfgang Stocker . Different stuff this time: Stone art. 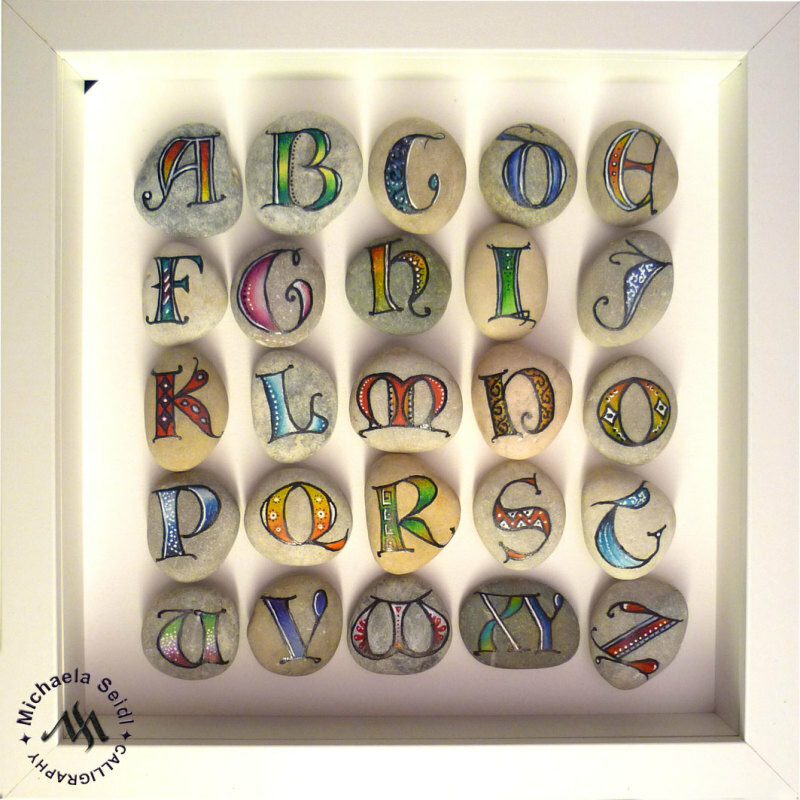 Different colored pebbles clued onto a canvas painted with acrylic colors. Candles done with origami paper, washi tapes, wrapping paper, ribbons, candles, matches and colored pencils. Plus one big foldout candle. Handwritten birthday wishes with calligraphy pen. 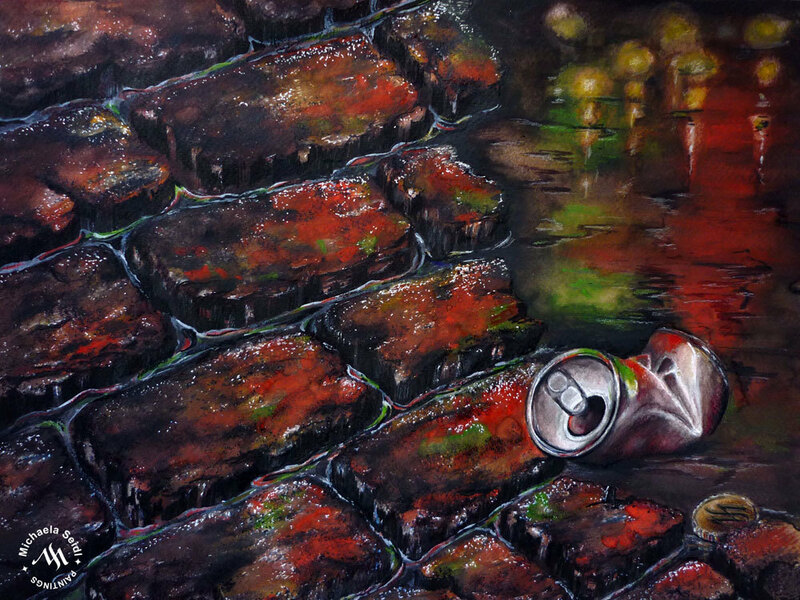 About 70 x 30 cm (28"x12"). 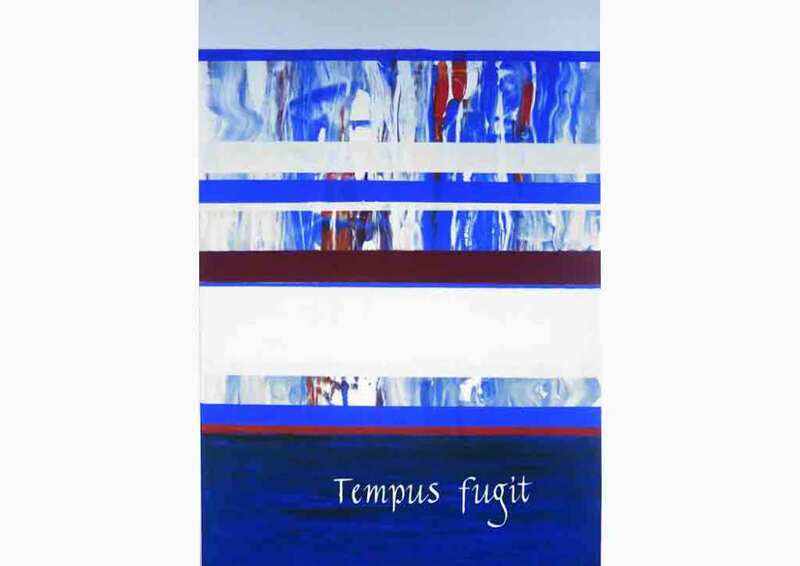 Acrylic colors on canvas with a touch of calligraphy added. 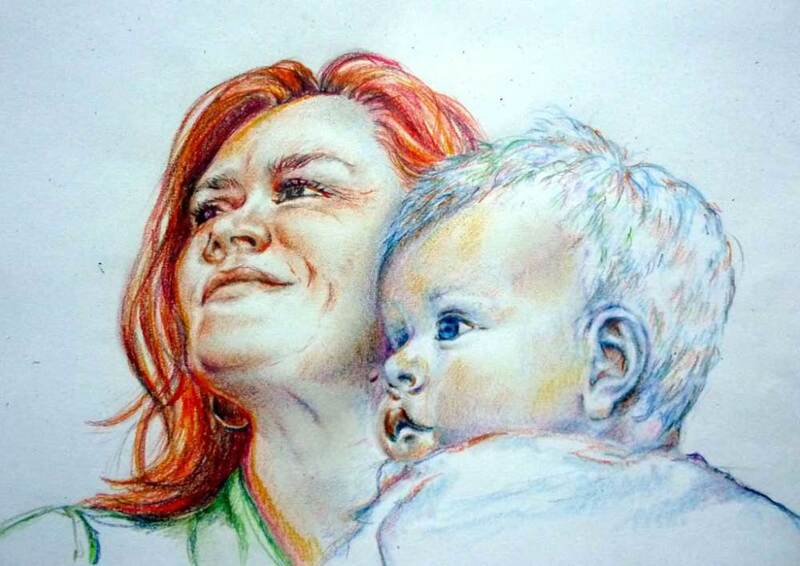 Colored pencil drawing of mother and child on A4 paper.